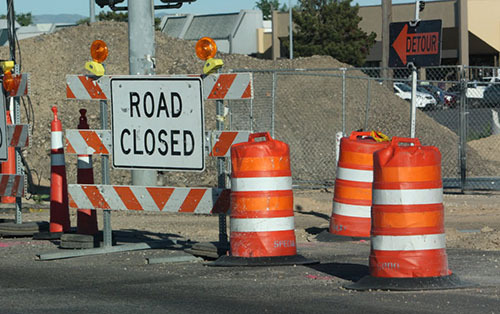 Roadwork is a necessary part of improving transportation in Ada County. 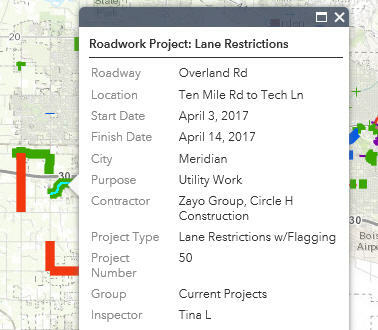 To make it as easy as possible to identify where work is taking place, ACHD provides an updated map of current road projects in Ada County, including ACHD and non-ACHD work called "Roadwork in the Area" or "RITA." There are several ways you can find information for current and future roadwork throughout Ada County. View a complete list of roadways currently having lane restrictions or closures. Updated daily (pdf). Listing of roadways having temporary restrictions or closures due to Local Events. Updated daily (pdf). ACHD construction project status updates. Updated weekly (pdf).